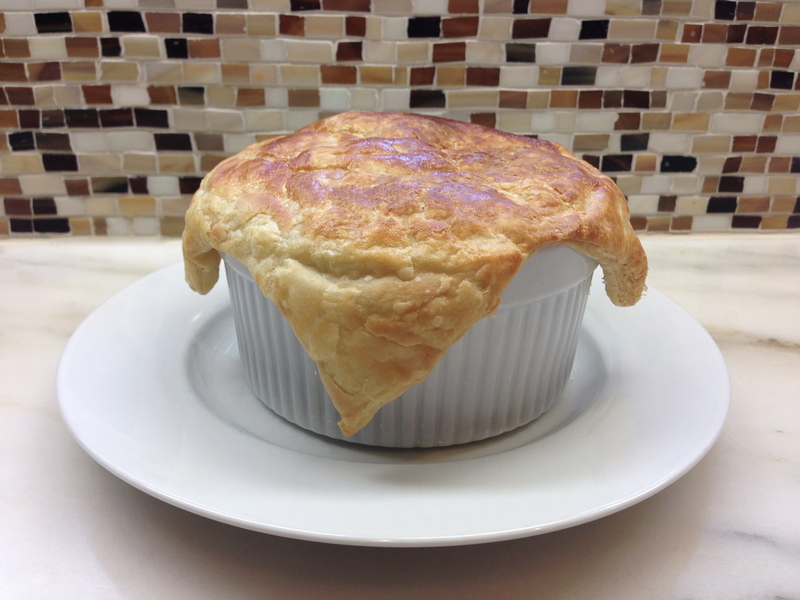 I have never been a fan of commercial pot pies, but I have always liked the idea of them. After doing much research, I decide to try the recipe from Williams-Sonoma Comfort Food, by Rick Rodgers, Oxmoor House, 2009. I modified the recipe to reduce the amount and type of fats used. Rather than making the recipe’s pie crust, I used Pepperidge Farm’s Puff Pastry. The leeks and tarragon add wonderful favors to the pot pie. My husband, who is a picky-eater, loved this! In a large nonstick frying pan, heat 1 tablespoon oil over medium heat. Add mushrooms and cook for about 6 minutes, stirring occasionally, until they start to brown. Then add leeks and carrots, cover and cook for about 5 minute, until leeks are tender. Stir in peas and remove from the heat. Using a large saucepan, melt the butter over low-medium heat. Whisk in flour and stir constantly for about one minute until it starts to bubble. Slowly whisk in chicken stock, sherry and tarragon. While whisking frequently, bring to a boil. Add chicken and vegetable mixture. Add salt and pepper to taste. Let the filling cool down until it is lukewarm, less than 1 hour. Preheat oven to 400 degrees. Spoon the chicken filling into ramekins or soup crocks. I filled the dish to within 1″ of rim. On a lightly floured surface, roll out puff pastry. Depending upon size of ramekin, roll out pastry so that it would cover dish. I was able to get 4 squares out of 1 sheet of puff pastry. Gently press the pastry around each ramekin. Brush each pastry top with the egg. Carefully poke the top with fork a couple of times. Place on cookie sheet and bake for about 20 minutes. Once the tops are nice and brown, cover loosely with foil to prevent the crust from burning. Serves 4. Blogger’s Note: The taste of the “gravy” was delicious, but I thought it could be a little thicker. Next time, I may add a little more flour or use a little less chicken stock. The ramekins I used were 5″ in diameter and 2 1/2″ in height. Depending upon the of your dish, you may get up to 6 servings.